Press Release for the show "A heap of broken images where the sun beats" * @The Aegean Center for the Fine Arts, Paros, Greece. “A heap of broken images where the sun beats” is the second exchange between artists from Greece and California, creating a dialogue between these seemingly disparate cultures. Like cartography of places and approaches, this exhibition will map points of coexistence. Although the works from “A heap of broken images where the sun beats” vary in terms of media and concept, most are working with a sense of place and light, and the contemporary notion of abstraction. Forming an impression, which spans the visual, the psychological and the historical, layered to create an existential experience of both time and place. The exhibition opens on September 9th with an installation of works brought to Greece from Los Angeles paired with works from Greek artists. Over the coarse of 3 weeks, Greek and Los Angeles artists will work on site, responding to what has been proposed to create an evolutionary exhibition which will culminate at the closing on September 23rd. Each day, new works are created and the existing works are rearranged. Greek artist Stella Meletopoulou will work on site to install her piece “Universe Remembrances” an expansive installation with a web of threads which create invisible walls defined and punctuated by bits of paper and wooden sticks. These broken and fragmented images create motifs of color and symbols, juxtaposing geometry with asymmetry, referencing memories from childhood. Los Angeles artist Dani Dodge’s installation “Fugitive Love Song” uses photographs taken of the song lyrics “just the way you are” installed in locations throughout the city of Los Angeles. Jenny Hager’s painting “Royal” is paired with Greek artist Nikos Sepetzoglou both of whom use fragmented imagery. 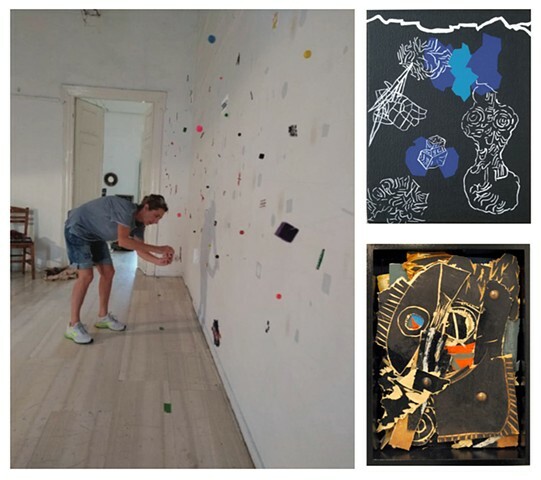 In the case of Nikos, he has chosen shards of painted and destroyed pieces of wood, to create an installation of broken pieces arranged to form a fragmented whole. Jenny Hager uses paint applied in multiple ways. Hagar works as a contemporary Abstract painter, with a color palette defined by place. Her use of keyed up colors, defined hard edge forms contrasted against soft fields of pastel colors place her squarely in the pulse of what defines abstract art in Los Angeles. The works from Los Angeles draw from the multicultural demographic of the city. Carlos Beltran Arechiga, a Mexican born Los Angelino with a background in Architecture uses a pastel color palette which reference the colors of Los Angeles and of his native Mexico and references the mid century modern architectural aesthetic popular in California. David Spanbock’s and Max Presneill’s work is both abstract and political, with graffiti like marks creating an aggressive urban pastiche. Joren Bossen’s aesthetic and use of color and imagery are defined by omnipresence of celebrity and pop culture, which defines Los Angeles. Greek artists Nikos Sepetzoglou and Anastasios Babatzias share a similar aesthetic with Los Angeles artists Alanna Marcelletti, David Leapman and Alison Woods, with fragmented and collaged imagery. Japanese American artist Kio Griffith video “Mother Earth will be making changes because we can’t be trusted any more” is paired with Greek artist Dimitris Katsoudas’s Burnt Brain series of specimen trees seemingly burned by fire. Working on site, Greek artists Elli Velliou will “repair” broken objects as an interactive performance, where objects symbolizing the fragility of human relationships, and Aliki Pappa will interpret lines of TS Eliot’s “Wasteland” with dream like black and white drawings. Also, Despina Nissiriou will be working on a site-specific installation with polyurethane, air drying clay and lentils in her own studio. Artist Dimitra Skandali will create an outdoors installation from pieces of broken Greek traditional fishing boats, while Los Angeles artist Alison Woods will be working on a series of abstract paintings exploring the intersections between technology and mythology and how one informs or cancels the other. Lastly, Greek artist Fotini Diella will be working on a site-specific installation based on photographs of found objects at the beaches adding spontaneously and sarcastically her everyday thoughts. “A heap of broken images where the sun beats” is the second collaborative exchange exhibition curated by Greek artist Dimitra Skandali and Los Angeles artist Alison Woods. The first exhibition “In the Stillness Between Two Waves of the Sea” in Los Angeles opened up the dialog between the two groups of artists. Thread, paper, painted wood sticks, and cut wood.